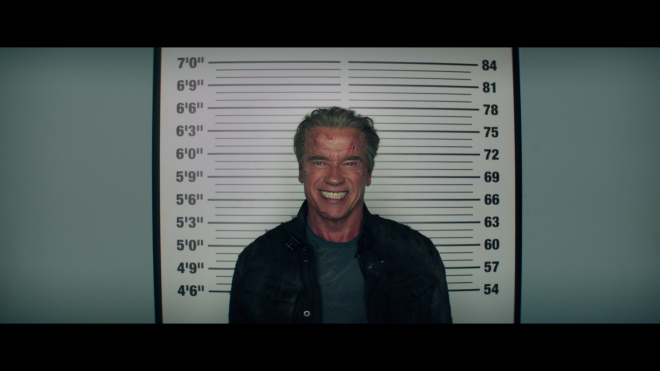 While not nearly as good as the first two original, Terminator: Genisys is a decently entertaining installment to the franchise and improvement over the last pair of sequels, just enough to satisfy loyal fans. The 4K Ultra HD Blu-ray stops judgment day thanks to a beautiful Dolby Vision HDR presentation, a near-reference Dolby Atmos soundtrack, and a great selection of supplements, making the overall package Recommended. After the last two passable but ultimately disappointing sequels (Rise of the Machines, Salvation), Terminator: Genisys travels back in time with the hopes of saving the franchise. And it does the job adequately — or at least, does so decently well — by heavily altering the original continuity established by series creator James Cameron. Although the attempt of an alternate timeline à la J.J. Abram's Star Trek isn't enough to reignite interest in seeing Judgment Day at the hands of machines, the fifth installment is nonetheless surprisingly entertaining, full of dazzling CG spectacle and grinding metal mayhem reminiscent of Cameron's Terminator 2: Judgment Day. Some of the most memorable moments are also some of the most absurd, such as witnessing an older T-800 Terminator (Arnold Schwarzenegger) battling his younger 1984 self or struggling against the T-1000 (Lee Byung-hun). In fact, the first act of the plot is essentially Schwarzenegger going toe-to-toe with the first two movies as if to suggest the filmmakers slapping down on a giant "start over" button. And part of this redo effort — a reboot-slash-sequel — also sees the return of Kyle Reese (Jai Courtney) fighting alongside his yet-unbeknownst son John Connor (Jason Clarke) before traveling to 1984, the moment that started it all. 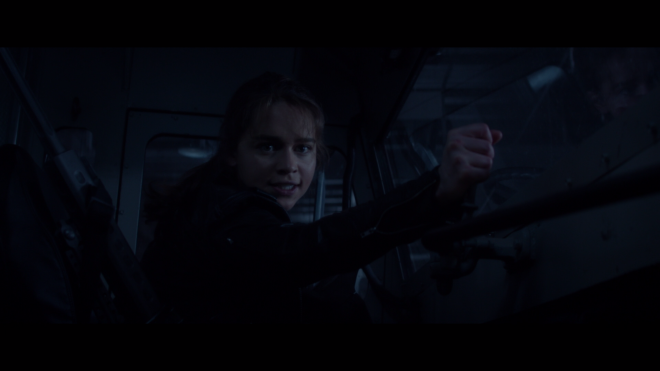 However, living up to the one of the franchise's more unforgettable quotes, director Alan Taylor (Game of Thrones, Thor: Dark World) creates an entirely new fate for familiar characters, starting with a significantly tougher, assertive and already disillusioned Sarah Connor (Emilia Clarke), an embittered hero who is Reese's equal rather than damsel in distress. Perhaps, one of the more interesting aspects of the plot is Skynet receiving a software upgrade and the A.I. program extending its telecommunication reach into contemporary society's addiction to social media. Added to that, Taylor freely injects some humor and amusing allusions to the series, most notably a role specially made for Matt Smith of Doctor Who fame, the centuries-old Time Lord who toys with the "wibbly wobbly, timey wimey stuff." For a more in-depth take on the movie, you can read our review of the French Import Blu-ray HERE. 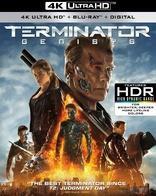 Paramount Home Entertainment brings Terminator: Genisys to Ultra HD Blu-ray as a three-disc combo pack with a flyer for a Digital Copy, which can be redeemed via paramountmovies.com and VUDU but, as we write this review, only available in HD / SDR and Dolby Digital Plus 5.1 (this may change on 6/12/18 when the movie is released). The dual-layered UHD66 disc and Region Free, BD50 copy sit comfortably on opposite sides of a center spindle while another Region Free, BD50 disc containing the bonus features is on the last panel. All three are housed inside a black, eco-elite case with a glossy slipcover. At startup, viewers are taken directly to a static screen with the usual selection along the bottom and music playing in the background. Time-traveling robot assassins deny everyone from changing their fate on 4K Ultra HD Blu-ay with an HEVC H.265 encode that looks suspiciously similar to last year's UHD French release. Only difference is Paramount bringing judgment day Stateside in fancy, shiny Dolby Vision HDR, delivering a really nice picture but not quite the night and day difference some were probably hoping for, so I'm repeating much of the same thoughts I shared on that package. Overall resolution and definition remain identical but definitely offer an appreciable uptick over the Blu-ray. Shot on the Arri Alexa camera system capable of 3.4K resolution, which was later mastered in a 2K digital intermediate, the 2160p video displays clean, fine lines around various objects in the background. The threading in the clothing is a bit more distinct while the creases and faded cracks in Pop's leather jacket are more visible than before. Every time John Connor morphs, viewers can better make out the unique features in his nanocyte body, like tiny little block with spikes scrambling everywhere. Worth mentioning, as well, are the few, negligible instances of aliasing around the sharpest edges of some objects and light fixtures. As before, the UHD's best quality is the significant improvement in brightness levels, and the difference is far more dramatic and striking than in any other aspect. 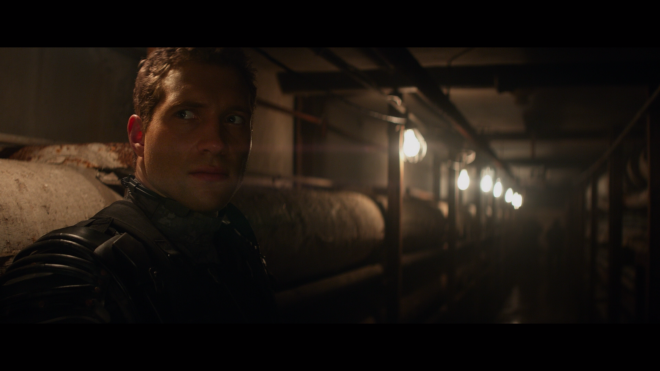 Compared to its SDR counterpart, sequences set in the middle of the night or taking place inside darkly-lit environments display deeper, penetrating shadows, such as Sarah's underground bunker or John's final offensive to stop the time machine in the first half of the movie. And amid all the darkness, the details of the small objects in the distance remain plainly visible, allowing viewers to see every piece of equipment in Pop's makeshift time machine or individual soldiers fighting the Terminator army during the invasion. The difference in blacks is also apparent in the clothing worn by our trio of heroes, looking inkier and more true-to-life than before, while still maintaining excellent variation between the various shades in the jackets, shirts, military gear and surrounding shadows. All in all, this Dolby Vision transfer delivers a better cinematic experience than its predecessors. Presented in a 2.40:1 aspect ratio, the 4K DV presentation also arrives at its 2017 destination with a brighter and slightly wider array of colors throughout, starting with better coloring in the faces, showing a natural, lifelike rosiness in the complexions. But again, the differences are very small and slight. There were a couple moments where the cast appeared somewhat flushed, but it doesn't happen often. Again, John's final offensive and the Sarah saving Reese sequence is a genuine highlight, showing perkier, more dazzling purples in the laser shots and a tighter, livelier shine in the red electric fence. Also, the armored truck is of a distinctly redder shade and while Sarah and Pops talk over a passed-out Reese, the red lights glow on each of their faces with more realism. 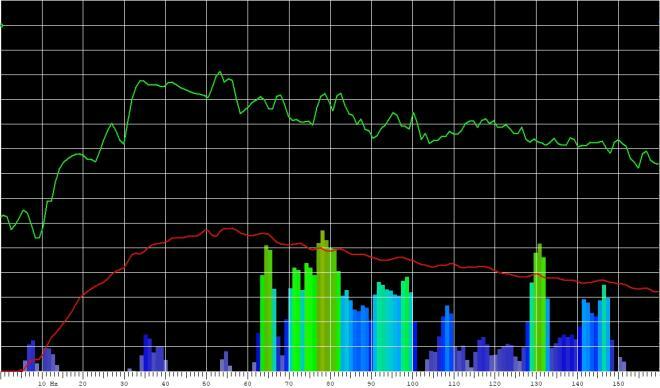 Unfortunately, contrast doesn't receive much of a boost, looking about the same as the HD SDR version and the DV doesn't really provide a notable improvement. Then again, whites are a tad more brilliant in many exterior scenes, and specular highlights are improved, providing the glow of light bouncing off metallic exoskeletons an impressively realistic shimmer and sparkle. Fire and explosions also reveal a bit more detailing within the brightest areas, making this the best way to enjoy the sci-fi action sequel. The killing machines from the future follow directives equipped with the same, near reference-quality Dolby Atmos soundtrack heard on both the Blu-ray and the previous French Ultra HD. Igniting the screen right from the start, Lorne Balfe's score sprawls across the screen and into the surrounds and front heights, keeping viewers fully engaged until the very end. During these same opening moments, laser blasts zoom in every direction and the engines of HK-Aerials fly overhead, immediately creating a satisfyingly immersive, dome-like soundfield. Quieter sequences are also littered with a variety of atmospherics circling the listener, such as water dripping from above while inside the sewer, acid showering from the ceiling or the heavy traffic commotion of the city. When using the time machine, the electrical pulses from either the machine or during a character's arrival flawlessly pan from one speaker to the next, and the final, climactic fight at the Cyberdyne complex is a good deal of fun. The object-based mix also enjoys detailed clarity in the mid-range, exhibiting sharp distinction amid all the mayhem and the clanging of metal upon metal. The background is continuously layered with convincing off-screen activity, generating a wide and spacious soundstage with excellent balance and separation between the channels. Amid the loud, ear-piercing chaos, the back and forth yelling between characters remains prioritized and intelligible. Best of all, the mix comes with an insanely powerful low-end, delivering some ground-shaking, wall-rattling bass to gunshot, punches and explosions. But the two standout moments are definitely the scenes with the school bus overturning on the Gold Gate Bridge and Pops' fight against John Connor inside Cyberdyne, featuring a couple hits that ferociously dig into 17Hz with strong decibels and a few other hits around 26Hz (bass chart). After the last two passable but ultimately disappointing sequels, Terminator: Genisys travels back in time with the hopes of saving the franchise, establishing a new alternate timeline full of dazzling CG spectacle and grinding metal mayhem that feels reminiscent of James Cameron's Terminator 2: Judgment Day. 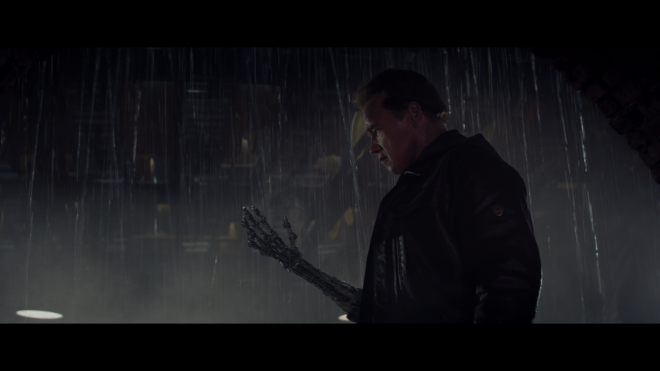 With Arnold Schwarzenegger reprising his famous T-800 role, the fifth installment to the series is a surprisingly entertaining do-over that should satisfy fans. 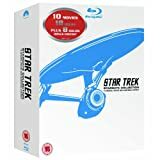 The Ultra HD Blu-ray comes courtesy of Paramount Home Entertainment, featuring an excellent 4K Dolby Vision presentation that's looks suspiciously similar to the French import but offers a noticeable improvement over the Blu-ray. The same near reference-quality Dolby Atmos soundtrack is ported over. Also included is the same set of supplements seen in the previous release of the movie. In the end, the overall package is recommended for 4K Dolby Vision enthusiasts.